Franconia Ridge via the Old Bridle Path/Ridge Trail/Falling Waters Trail was one of the first hikes I took as a young teenager. Over the years, I've gone back, bringing others to this magical place. After a number of trips taking this loop, I took a hiatus lasting many years. It was time to get back. My son Nick is living in North Woodstock (mere minutes from Franconia) for the month of September, and he had never hiked here before. We had plans to hike on Saturday, 9/8/18, and of course I had to take him to Franconia Ridge. I left NY at 5 AM on Saturday, picked up Nick at 8:30, and we were on the trail at 9. The parking lot was full, but we were able to park off the side of the ramp. Later when we came out, cars were lined down the roadside, even though there were signs saying "Park in Designated Areas Only". We checked with the ranger to confirm we could park where we were , and then we were off. It was quite obvious that the trails would be lined with people on this fine weather Saturday. The humidity of the summer had finally broken and it was a gorgeous day. The temperature at the base was expected to reach 60 degrees, but it was 39 degrees at the summit with 20 mph winds. We had hats/gloves/puffys and were prepared. Of course I brought my hound dog Rev and she was anxious to hike after being in the car for 3.5 hours. I chose the Old Bridle Path as the ascent route. Some people prefer to ascend via the Falling Waters Trail, since they'd rather climb the steeper trail then descend it. We passed seven or eight groups en route to the AMC Greenleaf Leaf hut. 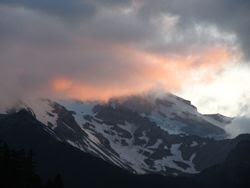 At the first viewpoint, we observed the clouds blowing over the summit at a good clip. View from the first viewpoint. We stopped at the Greenleaf hut so Nick could see it. I was kicking myself for forgetting to bring some money along with us on the trail. Nick would have bought some coffee and I would have bought some baked goods. At the summit, a group of people were trying to raise the American flag and a "Remember 9/11" flag. They were having some difficulty because the wind kept snapping their poles. Finally they had success! After having a few snacks and throwing on our wind shells, we began the glorious 1.7 mile hike along the ridgeline to Little Haystack Mountain. We saw perhaps 200-300 people on the ridge during this traverse. It was the perfect day to be out. At Little Haystack Mountain, we took a little more time to observe our surrounding before beginning the descent down the Falling Waters Trail. This trail is a steep descent, and is tough when wet or icy. On this day it was just steep and manageable. Nick enjoyed the variety on this loop, including the clouds, the hut, the ridge, the water on the descent. There is not much to dislike, except the crowds that flock to this area. If you can spare a weekday to make the trip, the crowds disappear. We'll be returning to the area on Friday 9/14 for more hikes. The weather looks great!